← Random Thoughts from Sri Lanka: Power Up! Monks from the Buddhist and Pali University in Sri Lanka take part in a conversation on new media. As my series of lectures progressed last week, I quickly decided to move away from all of my ‘established’ game plans. I prepared five powerpoints for the trip but I soon realized that many people just wanted to talk. Plus, the idea that I could show some multimedia presentations quickly evaporated in a country with slow Internet connections. Rather than sit and wait for a slideshow to upload, I went old school and talked…. By Friday I completely abandoned the powerpoints and just asked those present to ask me questions that were on their mind. I met with a mix of people during the week — students, professors, intellectual, activists and journalists. 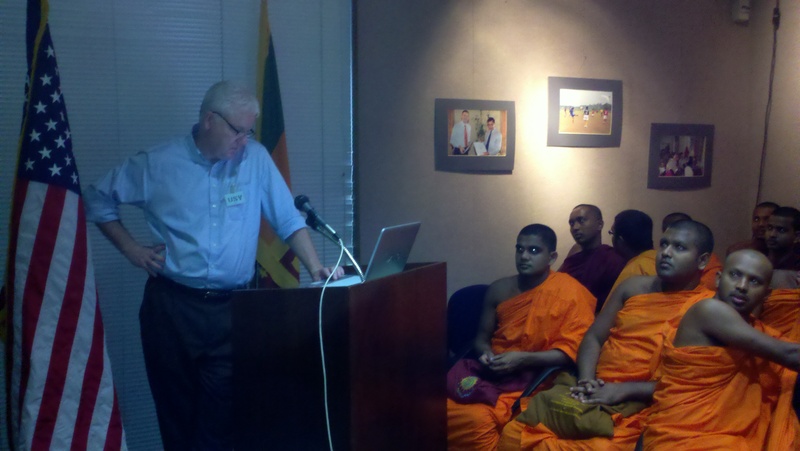 But perhaps the most interesting group came on Friday when about 50 monks filled the small lecture hall at the American Center in Colombo. Those of us who have been involved in new media for the past 15 years have seen the ‘digital divide’ argument come and go but I’ve seen that divide a little differently on this trip. Parts of this country are wired, but much of it isn’t. And while students, journalists and some intellectuals are making use of the Web as a research and communication tool, the full potential of the Web remains unrealized. But, mostly I spoke about the power of ideas and how they can be shared across the world thanks to the power of technology. But, perhaps the most surreal moment came as I spoke to the monks about Facebook and how to prevent bad folks from hacking in and hijacking your profile. It’s very much the same conversation I have with my 12-year-old soon — although, clearly the fears of operating and communicating in this society are a little more complex and serious. This entry was posted in Blogging, Sri Lanka and tagged Blogs, Business of Journalism, Sri Lanka, Steve Fox. Bookmark the permalink.